The name Woodley means ‘a clearing in the wood’. That wood may well have been Windsor Great Forest and evocative names still exist, such as Wheeler’s Green, Norris Green and Woodley Green. One of the most interesting houses in old Woodley was Bulmershe Court, built in 1777 by James Wheble, one of the local ‘squires’. The garden was said to have been designed by Capability Brown in the Italienate style; there was also an orangery, a copy of the two at Woodstock in Oxfordshire. Soon after his election as Speaker of the House of Commons, the house was bought by Henry Addington, where he lived when not in London. At the time of the Napoleonic war, the Woodley Yeomanry was formed, with Henry Addington as their commander. William Pitt was a frequent visitor to the house and it is said, when news of the war was favourable, the house was ablaze with light in order to let the people know. George III is also said to have visited the house. 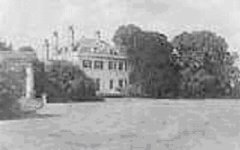 In 1801 the house was sold to James Wheble, a descendant of the first owner. It changed hands again in 1926, this time to a Mr. & Mrs. Short. The private chapel was converted into a small theatre and during the summer Shakespeare’s plays were performed in the shrubbery. During the 1939-45 war, the house was used by English and American troops and it later became a market garden. In 1963, it was demolished and a teacher training college built on the site. The site became part of Reading University and subsequently a residential development. One hundred years ago, Woodley was a small rural community with less than one thousand inhabitants. Fifty years ago, although the population had grown a little, the majority of the homes were not on main drainage and there was very little street lighting. Bread and milk were delivered by horse and cart and on Sunday afternoons the Muffin Man made his rounds with a tray of muffins on his head and announcing his presence by ringing a handbell. After the war, Woodley continued to grow; new industries moved in, housing estates were built, together with new schools and leisure facilities. In 1953, Douglas Bader opened the Coronation Hall. This replaced the old army hut, which had served Woodley well as its village hall since 1919, when it had been transported from Salisbury Plain. Woodford Park was officially opened in 1964 by Lord Luke, Chairman of the National Playing Fields Association. The Bulmershe Centre, with its swimming pool, sports facilities and youth club, was a welcome amenity, which opened in 1971. Woodley attained town status in 1974 and the population was then 29,000. Since then the figure has been reduced to 26,000 by boundary changes. In 1972, the A329(M) was constructed as a feeder road for the M4 and this passed over Loddon Bridge Road, parallel to the railway. Three workmen on this project lost their lives when the scaffolding at this point collapsed. In order to complete this road, the course of the River Loddon had to be diverted. Its original course can still be seen by the line of willows that once bordered its banks. The pedestrianised shopping centre replaced the village shops and Lytham Road was constructed to provide access between Crockhamwell Road and Headley Road, on a site originally occupied by a market garden. The old Woodley spirit still prevails and Woodley residents show a high level of concern and interest in any changes proposed in the town. The Woodley Carnival is a huge event with a week-long timetable of events culminating in the Carnival Day and procession. All money raised is donated to local organisations. The Carnival first took place in 1960, to raise funds to build a youth centre. Geoff Goodworth and Max Steggles, members of the Woodley Venturers Youth Club, were its instigators.